Don’t look a gift-horse in the mouth, goes an old saying, but it seems that the Education Minister of Punjab is doing precisely that. The cash-strapped state is refusing to implement a Rs 65-crore Central Government scheme under which some money would be paid to those individuals who inspire illiterate persons to learn reading and writing. THE US has averted the fiscal cliff – a term coined by Federal Reserve Chairman Ben Bernanke to refer to a bundle of automatic tax increases and spending cuts that would have come into effect on January 1 had a deal not been reached between the ruling Democrats led by President Barack Obama and the Republicans, who control the House of Representatives. Monetary policies put in place in India to tame or contain inflation are solidly logical. Normally, the monetary policy trajectory extends over the whole of the fiscal year. Appropriate corrections are, however, made six monthly for steering the economy on the path to be followed keeping in view the ground realities of changes in the socio-economic variables as determining factors. MY predicament! Believe me it is as serious as that of Hamlet, “To bathe or not”. A question of immense magnitude. Isn’t it? Rather touching water, more so pouring it on myself. Hell of a job in these terribly chilly times. My goodness! Mercury has dipped unprecedently low. Such harsh cold days and taking bath! Ooh! Even with hot water! Bath is bath with hot or cold water. Pak’s nuclear arsenal in safe hands? AS long as Rawalpindi declines to take sustained preventive action against future attacks by extremist groups, the presumption of continued collusion will remain. Future crises could occur because bilateral ties with India remain badly frayed or, conversely, by official efforts to improve ties that extremist groups wish to stymie. Don’t look a gift-horse in the mouth, goes an old saying, but it seems that the Education Minister of Punjab is doing precisely that. The cash-strapped state is refusing to implement a Rs 65-crore Central Government scheme under which some money would be paid to those individuals who inspire illiterate persons to learn reading and writing. It may well be that there are some issues regarding various schemes mooted by the Centre, as the minister maintains, but surely these issues can be sorted out. School education in Punjab faces many hurdles. Lack of funds, an insufficient number of teachers and inadequate infrastructure have all contributed to the dismal state of education in which anyone with means ensures that his or her children study in a private school. This happens even as there are government schools that do not have enough students on the rolls. The minister needs to take a long, hard look at the kind of schooling that is being provided to the future citizens of the state. He will find that he needs all the help he can get to rejuvenate what is essentially an ailing sector. As education is a state subject, the responsibility lies with the state government, and not with the Centre. The mid-day meal scheme has met with success in enrolling and retaining students into schools all over the nation. The claim that Punjab is a special case, and that there are only a few poor families in the state, does not make a convincing rationale for diverting the money meant for the mid-day meal scheme, to improve infrastructure and provide uniforms. It is high time the state government ensured better education for all children. For this, it should do whatever is necessary, including sorting out any pending issues with the Centre. THE US has averted the fiscal cliff – a term coined by Federal Reserve Chairman Ben Bernanke to refer to a bundle of automatic tax increases and spending cuts that would have come into effect on January 1 had a deal not been reached between the ruling Democrats led by President Barack Obama and the Republicans, who control the House of Representatives. More taxes on Americans and lower government spending would have pushed the US economy into recession, spelling trouble for other global economies too. Post agreement, much of the world has felt relieved. The US, European and Asian stock markets rallied sharply in the first two days of the New Year. The Republicans and the Democrats differ on how to handle government finances and the economy. The Democrats favour higher state spending and taxes on the rich. The Republicans oppose taxes and support cuts in government spending, believing in minimum government. In 2001 Republican President George W. Bush cut taxes, which over the years drove the US into heavy debt and raised the fiscal deficit. The tax cuts were to expire on January 1. President Obama wanted higher taxes on all Americans earning more than $ 250,000 a year. In the face of stiff Republican opposition he agreed to tax hikes on those making $400,000 a year ($450,000 in case of families) or more. The Republicans were divided on Obama’s proposal for tax hikes. But to avoid serious consequences of falling from the fiscal cliff, the Republican-controlled House of Representatives passed the Bill by a 257-167 vote. The US still faces at least two major hurdles. One, the US government’s coffers may go empty by late February or early March and the Republicans must agree to raise the borrowing limit to save the government from defaulting on its financial obligations. Two, if the Republicans withheld support, automatic cuts would come into play in about two months, reducing budgets of Federal agencies by 8 to 10 per cent. The Republicans can force a repeat of 2011 when the US government came close to shutting down. THE Internet is ubiquitous today and it is hard to imagine that its origin came about just three decades ago when the Advanced Research Projects Agency Network (ARPANET) was switched on, forcing a change from then prevalent Network Control Protocol to the Transmission Control Protocol/ Internet Protocol (TCP/IP). The objective of the TCP/IP was to ensure that various computers could communicate with each other, and the networked system could link government and scientific organisations across the US. Till then computers had to be physically linked with each other, and this limited networking possibilities. The World Wide Web, which is one of the services on the Internet, started as a browser developed by Sir Tim Berners-Lee in 1990. It changed the way the world used the Internet, since it enabled and encouraged civilian access, especially through graphical browsers, predominantly Netscape, and its rival, the Internet Explorer. With billions of pages and content of all kinds in most of the languages of the world, the World Wide Web has become the major content provider to the world. It has spawned its own economy and business models, some widely successful, and in short it has changed the way in which many things are done. Internet connectivity has become a barometer of development for most nations and even individuals. Indeed, it is hard for the present generation to imagine a world that was not so well connected, one in which services like Wikipedia, social networking sites, online reservations, maps and so on were not available. ARPANET had military objectives, and it is to the credit of the US government that it was allowed to be opened up to the world. All those who talk about controlling the Internet will do well to remember that its genesis lies in a system that was created to continue working even in the event of a nuclear strike destroying major communication centres. The Net is here; the world has embraced it, and is celebrating its success by using it in ways that had never been envisaged by its founders. There are a few quite serious concerns the monetary policy has to deal with. First is the liquidity in the economy that has to be managed at appropriate levels to promote economic growth to the optimum. Although monetary instruments like the cash credit ratio (CRR) and the statutory liquidity ratio (SLR) with the banks as well as repo and reverse repo rates have sometimes been used to create more liquidity in the money market to facilitate government borrowings through the sale of government securities, these were only a few aberrations. The main purpose of managing the level of liquidity remains to be the promotion of economic growth without fuelling the rate of inflation. The level of liquidity in the money market is determined by the expected rate of inflation plus the rate of economic growth targeted in the economy. For instance, if the rate of economic growth is targeted at 8 per cent and the expected rate of inflation is 9 per cent, the additional liquidity injected into the markets will be around 17 per cent. The instruments of CRR and SLR are resorted to if the liquidity in the market has to be increased to promote investment or is to be squeezed to contain inflation that adversely affects the very vitals of the economy in terms of hitting growth, income levels and the purchasing power of the people. Thus, inter alia, taming of inflation becomes one of the key objectives of the monetary policy. Another aspect of the monetary policy is the concern with the management of the value of domestic currency vis-à-vis the value of the reference foreign currency — the US dollar in our case. The policy that has matured through time is not to control or contain the exchange rate at a certain level, but to mange it in the open market so that the rupee value does not improve or decline in a volatile manner. Smooth and mild or moderate movement of the rupee value upwards and downwards is managed through selling and buying of foreign exchange in the money market. Though there are several economic and political factors that influence market sentiments that determine the rupee value, buying of foreign currency releases more rupee currency in the market and the rupee value depreciates because of the reduced supply of foreign currency and the enhanced supply of the rupee. Vice-a'-versa, selling of foreign currency increases the supply of foreign and reduces the supply of rupee currency that helps the rupee appreciate, and foreign currency depreciates in value in the market. Since buying and selling of foreign exchange affects liquidity in the market, in turn it influences the rate of inflation also. Hence, accumulation of foreign exchange, in the absence of matching growth of the economy, is inflationary in its very nature. On the other hand, foreign exchange earnings also mean that goods and services have been exported and corresponding domestic currency released in the market, which also has inflationary influences. However, if foreign exchange flows in as FDI, it promotes growth to match the rupee liquidity created through the conversion of foreign currency into the rupee. Also, in case the net balance of trade remains negative, it has positive influence in containing the rate of inflation because more goods and services flow in vis-à-vis their outflow, and more foreign currency moves out of the market, squeezing the domestic currency in turn. In simple terms, the ratio of goods and services to the money supply improves that has healthy an effect on the price level. Yet this depends on the digestive capacity of the economy in respect to its GDP growth. China, for instance, has a very high level of foreign exchange reserves compared to that in India, yet has a high rate of GDP growth with little effect on the rate of inflation. The question that begs an answer is: With India having very competent monetary policy experts and all instruments of monetary policy known and put in action, why is inflation going out of control, touching a double digit figure and GDP growth declining by the day? Global slump is certainly affecting foreign trade adversely. The impact of economic, depression in the world market reduces employment affecting the purchasing power in the economy, and inventory builds up due to the lack of market clearance. All this should have a depressing effect on the price levels in the economy. Yet what is happening is exactly the reverse. Another aspect is that per capita food supply in the country, both in terms of food grains and protective foods, except pulses, has increased mani-folds over time, which should have a healthy effect on price levels, yet that is not happening. It is a kind of paradox. To a considerable extent, the answer lies in the unaccounted /black money that is floating around freely over which the Reserve Bank of India has no control. This black economy is no less than half of the total economy and is growing by the day. When the RBI puts a squeeze on the money supply (liquidity) in the market, it works only on the genuine money. The real culprit, the black money, remains out of the net which is the real cause for escalation in the market prices. When the squeeze is put on the genuine money, it adversely affects investment and, in turn, growth in the GDP. Consequently, the outcome is the reverse of what is expected and inflation is fuelled further. If India is to escape this sort of stag- inflation, the country must put a determined check on unaccounted money floating around in the country. It is not impossible or difficult to do so. It requires only political will to take hard decisions, which seems to be a remote possibility under our system of vitiated democracy. The writer is a well-known economist and Chancellor of Punjab Central University, Bathinda. Don’t you think God has been unkind and unfair to we human beings? Wish He had gifted us with a skin similar to that of animals and birds. Hell with the wretched daily ritual. A curse on the two-legged animals. Isn’t it? Nothing is more incompatible and incongruous than winter and bathing. Only a daredevil ventures into pouring mugs after mugs of water on him. The very thought of the so-called religious men bathing in icy cold water in the wee hours scares me mortally. It gives me shudders. Maybe they invoke the gods and recite mantras loudly to ward off cold. The day I miss bath (to be frank it is quite often. Don’t get shocked if daily too!) I feel myself in the seventh heaven. I decide beforehand that I won’t bathe next morning. This induces sweet slumber and leads me to the land of “fancy”. Believe me I dream of my siblings undergoing the torture afflicted on them by “Jal Devta”. What a scene! When youngsters are pushed into the washroom and forcibly given a bath by their mother, I enjoy the cosy quilt. I purposely laugh and sing songs teasing them. Imagine my joie de vivre at their misery. An experience I cherish most. A ‘D’ day for me when I “take bath”. An excruciating moment, indeed. Willy nilly, I make a grand beginning paying obeisance to the bucketful of “Jal Devta”. The prime question that looms large before me is how to begin. The real predicament. An ordeal not less than climbing Everest. I invoke all the gods before I dip the tip of my little finger with a heart trepidating at a marathon speed. I purposely keep it a little higher than the level of water. I dare not touch it… the tale is repeated… don’t know how many times.. Finally, I dare dip it. What a brave deed! I pat myself. A mere touch of water sends shivers down my spine. I am afraid mother will come to know the game played by me. Hence I keep the tap running. “Scarcity” of water? I know not. Face ought to be washed well. Should not betray sleepy look. Washing? No. Wiping with semi-wet towel will do. Surely, I see to it that hair too should be a little wet, otherwise I would be caught red-handed. The trick works. To my joy, mother always presumes I have accomplished the “brave deed”. Ough! Bad luck. Now wife has taken over the mother’s role. I need to be extra vigilant. The primary reason for escalation control during past nuclear-tinged crises has been that Indian leaders have chosen not to respond militarily to severe provocation. Instead, they have given the pursuit of economic growth a higher priority than the pursuit of the perpetrators of mass-casualty attacks. New Delhi has also been concerned about escalation control in the event of retaliatory strikes. If this calculus of decision remains firm, deterrence stability can withstand future challenges. If not, deterrence stability and escalation control will become increasingly challenging. India and Pakistan have signaled resolve during severe crises by increasing the launch readiness of their ballistic missiles and by carrying out missile flight tests. Key indicators of a decision to attack during full-scale mobilisations are well understood. Critical troop movements and preparations can be monitored by human intelligence and by technical means. In addition, the United States has relayed information derived from high-level visits, defence attachés and national technical means to dampen apprehensions during crises by rebutting false rumors and confirming de-escalatory steps. Because authorities in India and Pakistan have wished to avoid major wars, have been familiar with the choreography of full-scale mobilizations, and have mutually agreed to accept a significant US crisis management role, severe crises since 1990 have been managed, albeit with difficulty. Pakistan is on course to produce a large nuclear arsenal to support ambitious nuclear targeting objectives. Several of the conditions for war avoidance and crisis management have changed or may no longer apply, making deterrence stability more difficult to reinforce in crises. To begin with, Pakistani and Indian nuclear weapon-related capabilities have diversified and grown. Added capability does not automatically equate to added deterrence stability; to the contrary, more nuclear weapons repositioned or forward-deployed in a crisis could result in less deterrence stability. In the US-Soviet context, the growth in number and sophistication of nuclear arsenals - including assured retaliatory capabilities -- was not mutually reassuring. Instead, these nuclear buildups heightened a mutual lack of trust and aggravated serious, unresolved grievances. This is likely to be true for the subcontinent, as well. Moreover, Pakistan and India possess new nuclear capabilities that have not figured prominently or at all during prior crises, including tactical nuclear weapons, cruise missiles, and nuclear weapons at sea. 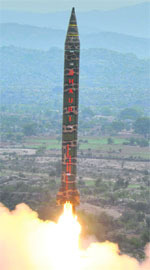 There has been one reported instance of the forward deployment of Indian short-range missiles - the Prithvi I - in late May or early June, 1997. At the suggestion of the Clinton administration, Prime Minister I.K. Gujral quietly directed that these missiles be moved back to their base. The introduction by India and Pakistan of cruise missiles and sea-based deterrents add further difficulties for deterrence stability and escalation control. Detection capabilities for ballistic and especially cruise missile launches would be challenging, let alone the prospect of successful intercepts. The movement of cruise and ballistic missiles to sea could provide harsh tests for command and control. The nuclear deterrents of India and Pakistan consist primarily of ballistic missiles, which makes deterrence in South Asia Army-centric. The two Air Forces have played an important, but secondary role, in the past. This could change significantly, if New Delhi chooses to respond to attacks by extremist groups with a punish-and-leave, as opposed to a seize-and-hold strategy. The two Navies will remain hard to employ for nuclear signaling purposes, although both are on the path to become the newest leg of their respective triads. Pakistan is on a path to deploy cruise missiles at sea, while India intends to deploy both cruise and ballistic missiles at sea. With diversified nuclear deterrents, integration, joint operations, and command and control across military commands and services become of even greater importance. The armed forces of Pakistan and India have been particularly resistant to joint operations and integrated war fighting. One prominent example was the 1999 Kargil operation, in which a small group of officers within the Pakistan Army planned and executed an initiative with high escalatory potential, without the knowledge of the Air Force and Navy Chiefs of Staff. Another example is the position of Chief of Defence Staff of the Indian Armed Forces, whose creation a Group of Ministers strongly recommended in 2001, and which has yet to be filled. Another negative development for deterrence stability is that Washington's credibility as an "honest broker" between India and Pakistan has become more problematic as US ties with India have improved and those with Pakistan have deteriorated. The steady worsening of US-Pakistan relations could have an upside if, as a consequence, Rawalpindi decides that improved relations with India are required as a compensatory step. If, however, another severe crisis erupts with India, Pakistani security managers will be faced with the potential for military engagements along two borders with little prospect for back-up from either Washington or Beijing, which has been notably cool to Pakistani requests for assistance during previous crises. While Pakistani leaders no longer trust the United States as an intermediary with India, no substitute to Washington is in clear view. Crisis management could therefore become even more challenging in the event of more spectacular attacks on Indian targets by individuals based and trained in Pakistan. Pakistan's nuclear weapon-related programmes have successfully met requirements established by a small group of decision-makers. After surmounting many barriers to acquire these capabilities, Rawalpindi has accumulated a large, growing, and diversified arsenal of warheads and delivery vehicles. It appears that the requirements set for minimal, credible deterrence were high at the outset, and have grown higher still after the US-India civil nuclear agreement and after the adoption of a more proactive Indian military posture. Earlier Pakistani claims that their doctrine of minimal, credible deterrence was incompatible with an arms race are now increasingly subject to question. At present, Rawalpindi's nuclear requirements emphasize credibility rather than minimalism. Pakistan is on course to produce a large nuclear arsenal to support ambitious nuclear targeting objectives. At the low end of these requirements, Rawalpindi has developed the capability to signal New Delhi and the international community that hostilities must end promptly. At a medium level, Pakistan appears set to acquire a large number of tactical nuclear warheads for use against Indian integrated battle groups. At the high end, Rawalpindi appears able to engage in significant counter-value targeting, and to deny India victory in the event of a complete breakdown in deterrence. Altering Pakistan's current growth trajectory in nuclear weapon-related capabilities would require a different orientation toward India by Pakistan's military leaders, severe perturbations in Pakistan's economy, and/or a perception-shattering event that causes nuclear advocates to re-think their assumptions. New leaders are capable of surprising shifts in longstanding nuclear and national policies, as exemplified by Mikhail Gorbachev, Ronald Reagan, and Deng Xiaoping. Army Chiefs in Pakistan have been a diverse lot; it is possible for one to be appointed who believes that a more relaxed nuclear posture toward India is warranted. Pakistan's continued economic woes might be a factor in this decision, but shrinking budgets could just as easily result in more emphasis being placed on nuclear deterrence as conventional capabilities atrophy. The leaders of the three major political parties in Pakistan have vocalised their interest in improved relations with India, especially with respect to trade, but the extent to which they are able to bring Rawalpindi on board is in question. No matter who forms the next Pakistani government, the Prime Minister, along with his Indian counterpart, will find it difficult to normalise bilateral relations in the likely event that extremist groups seek to blow up progress. Perception-shattering events on the subcontinent could have negative or positive effects. A settlement of the Kashmir dispute is hard to envision, and even if it were to occur, it is unlikely to affect the agendas of extremist groups based in Pakistan. An accident at a nuclear facility on the subcontinent would surely impact domestic plans for growth in this sector and could generate public opposition to military programs, as well. Political upheavals in Pakistan that usher into power religious parties and jihadist groups remain unlikely. Of all the perception-shattering events one can envision in Pakistan, the most likely would be an economic collapse, rather than a continued, steady economic decline. This scenario, more than any other, could significantly alter the role of the military in Pakistan's society and its outsized share of budget allocations - including those for nuclear weapon-related pursuits. This scenario could also spell great difficulties for maintaining the safety and security of Pakistan's nuclear arsenal. The safest route to reducing nuclear dangers remains patient, persistent, top-down efforts to normalise relations between Pakistan and India. Success in this pursuit is dependent on the recognition by Pakistan's military leaders that they possess a sufficient arsenal to secure their objectives, that their current path does not strengthen or stabilise deterrence, and that Indian leaders seek a properly functioning Pakistan more than a submissive one. Is this scenario realistic? Perhaps not, but deterrence built on very weak economic foundations is unsustainable. The writer is the co-founder of the Stimson Center and a Diplomat Scholar at the University of Virginia. He is the author of "Better Safe than Sorry: The Ironies of Living with the Bomb"